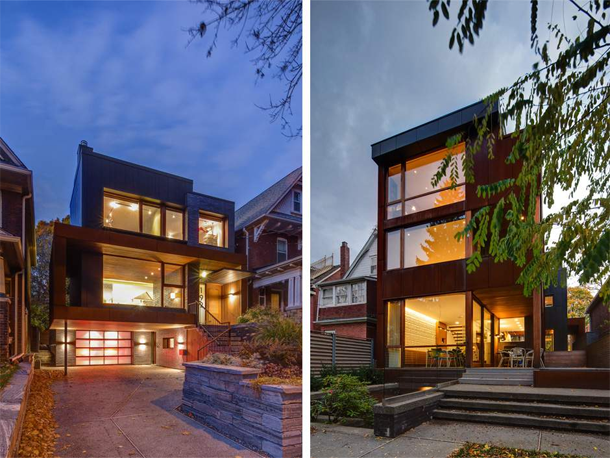 Modern homes rankle homeowners in established Toronto neighbourhoods, but do they have to? Older homes in many Toronto neighbourhoods such as Forest Hill and Trinity Bellwoods are being torn down and replaced with brand new, more modern looking homes. In East York, owners are adding a second story to many of the postwar bungalows which can change the aesthetic of the neighbourhood. You may have seen some examples firsthand. Wander through the streets of Trinity Bellwoods like Euclid, Manning and Richmond and Strachan and you’ll see clusters of new townhomes in a more modern style than the homes around them. You’ll also see the result of some teardowns – a modern home stuck in among the older homes. There seems to be a lot of fuss when an older home is torn down – but it’s not always a bad thing. Of course, if this was happening in Cabbagetown or Riverdale it would be a travesty. But many of the homes being torn down are not beauties. Some were built as recently as the 1960s with seemingly no thought to aesthetic, which is the opposite of what’s being described in this piece from the National Post about what’s happening in Toronto and why it may not be the worst thing to happen. Thankfully, the city has declared some neighbourhoods as Heritage Conservation Districts, including Cabbagetown, Riverdale, South Rosedale and Wychwood Park. This means that very little if anything can be done to the exteriors of the homes here.